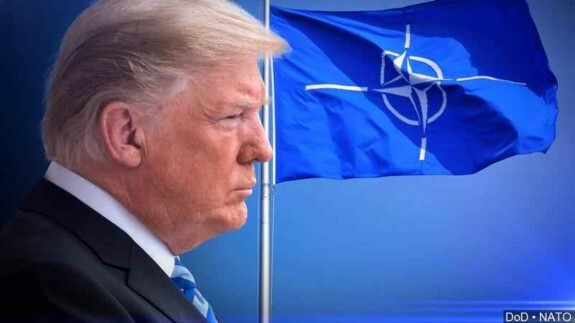 "Many countries in NATO, which we are expected to defend, are not only short of their current commitment of 2% (which is low), but are also delinquent for many years in payments that have not been made. Will they reimburse the U.S.?" Establishment media types, neo-cons and #NeverTrump crybabies would like Americans to think that getting the Western European nations to be responsible for their own defense is a novelty born of Donald Trump’s 2016 election, but how deeply to embroil the U.S. in the defense of Europe is a hard question conservatives have been asking since the post-World War II establishment of the alliance. In his recent bestseller Three Days In January, FOX News’ chief political correspondent Brett Baier recounts a 1951 conversation between conservative icon Senator Robert A. Taft and future President General Dwight D. Eisenhower. Taft was at that point the leading Republican candidate for President and Eisenhower, the military commander of NATO, was not yet a candidate. Taft was outspoken in his opposition to NATO, hewing to the non-interventionist philosophy of America as separate and not beholden to the world at large. As Jacob Heilbrunn, editor of the National Interest, noted in a recent column for the Los Angeles Times, Senator Robert Taft — known as “Mr. Republican” — voted against joining the alliance in 1949. He argued that by encircling Russia, NATO would create a self-fulfilling prophecy of war with the then-Soviet Union. The United States, Taft said, could not afford to become a Sir Galahad protecting the rest of the world. Baier wrote that “Taft refused to commit to a system of mutual security – especially for Europe, but in other locations as well.” Taft’s opposition to NATO and an expansive U.S. military presence around the world was one of the issues that convinced Eisenhower he should run. But Eisenhower’s victory in the 1952 presidential election hardly settled the issue of whether the United States should be the policeman of the world. But in his criticism of Trump Mr. Heilbrunn left out any analysis of the contribution of Ronald Reagan to ending the Cold War, and Reagan had his own troubles with NATO and our Western allies contributing their fair share to the defeat of the Soviet Union. President Reagan presided over the greatest peacetime defense buildup in history, from high-tech weapons systems to larger training ranges and military pay increases. It was his focus on engaging the Russians in a relentless economic war that brought down the Soviet Union. Between 1980 and 1985, the number of dollars the United States devoted each year to defense more than doubled, from $142.6 billion to $286.8 billion. In 1980 the United Kingdom spent 4.49 percent of GDP on defense, rising to 4.76 percent of GDP in 1985, but British defense spending had dropped to just 3.61 percent of GDP by the time Reagan left office in 1989. In 2016, the most recent year reported, the British spent a mere 1.82 percent of GDP on defense and the Germans, a mere 1.18 percent of GDP. In the most recent spending bill President Trump and Congress again increased American defense spending, and our allies will benefit as they have done in the past. President Trump’s recognition that the United States cannot and should not continue to subsidize the quality of life for our allies is hardly a conspiracy theory, but an overdue recognition that the Reagan defense build-up was expended long ago, and if the Western alliance is to be maintained, then all its beneficiaries must pay their share. *All foreign defense spending sourced from Stockholm International Peace Research Institute (SIPRI), Yearbook: Armaments, Disarmament and International Security. George Rasley is editor of Richard Viguerie's ConservativeHQ.com and is a veteran of over 300 political campaigns. A member of American MENSA, he served on the staff of Vice President Dan Quayle, as Director of Policy and Communication for Congressman Adam Putnam (FL-12) then Vice Chairman of the Oversight and Government Reform Committee's Subcommittee on National Security and Foreign Affairs, and as spokesman for Rep. Mac Thornberry now-Chairman of the House Armed Services Committee.